Training FFA members for the Food Science and Technology CDE? Need example math problems for your students to work out on? Look no further. This math quiz has 5 multiple choice questions for your students to test their knowledge on. 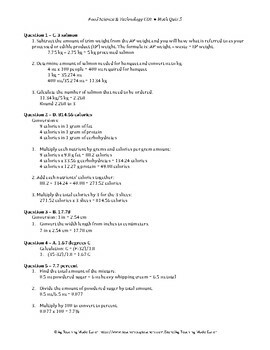 The quiz was created using the guidelines from the National FFA Organization's rules for this practicum. There is a key included that has the math formula or steps that need to be taken in order to arrive at the correct answer. 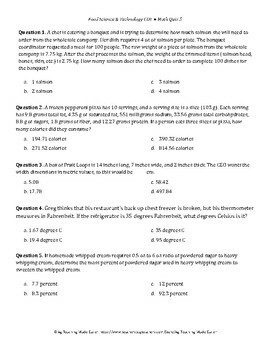 This quiz includes questions about product needed using edible weight calculations; calorie calculations for a food item; unit of measurement conversions; temperature change; mass percent.